Deter thieves from stealing your notebook and the personal information inside with this 6', 5.5mm carbon strengthened steel cable that anchors it to a desk or immovable object. Patented, T-bar locking mechanism and super-strong, carbon tempered steel cable provide maximum protection that attaches to the standard Kensington security slot found in 99 percent of notebooks and many computer devices. Secure, protect and lock down your computer and leave it safe. Built-in defense system guards against lock tampering. Low-profile lock heads won't block notebook ports or lift laptop off the desk. 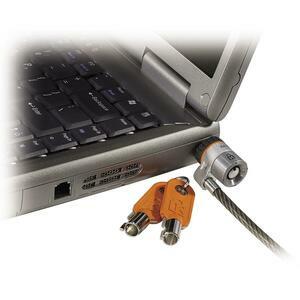 Notebook lock includes two keys and a rubber cable tie for cable management.